All observers of the Syrian war (2011 – ) agree that it was the lack of international pressure that led to a feeling of impunity on the battle field, which in turn inflamed the atrocities. Syrian opposition members, almost unanimously, blame Obama’s red line (August 2012) as one of the main reasons for opening the gates to all sorts of war crimes in Syria. Because this is simply wrong, I have been criticizing this Obama-bashing from the very beginning. Making wrong analyzes leads to fighting the wrong foes (see the later part of this article). Maybe that is the intention of some, but it is against Islam and doesn’t serve the Syrian democracy movement. Much of the “confusion” stems from a wrong contextualization. To understand this, let’s find out what Obama’s red line was all about. For a historical flash back, I warmly advise the excellent Washington Post article “President Obama and the ‘red line’ on Syria’s chemical weapons”, that you can find here : https://www.washingtonpost.com/news/fact-checker/wp/2013/09/06/president-obama-and-the-red-line-on-syrias-chemical-weapons/?utm_term=.da439e0e8338 . It is clear that the August 20,2012 interviewer, who triggered the whole debate, was talking about an unilateral military action from the US. According to the UN-charter, this is only allowed in cases of self-defense, and Obama’s answer followed that line. The US maintains quite a large definition of self-defense, and interprets it as the right to the use of military force whenever its core national interests are threatened. Obama could never have unilaterally intervened in the Syrian war for reasons of self-defense beyond the scope of what the US had defined as being its core interest. By definition would any military intervention have been limited to in one or other way the destruction of the chemical weapons stockpile or limited reprisal attacks. From the other side, strictly taken, did Obama never publicly preclude a military intervention within a broader coalition like the one that was undertaken during the Libyan civil war (2011), with United Nations Security Council approval. Neither did he publicly preclude a humanitarian military intervention like the one that was undertaken during the Kosovo war (1999), without United Nations Security Council approval. It is just that there was absolutely no international support for this kind of interventions. France and the UK, who were the driving forces behind the 2011 Libyan intervention, time and again publicly stressed that they would not take any action in Syria without the United Nations Security Council approval. Practically all UN Security Council resolutions that were designed to put more pressure on the Assad regime (none of which foresaw military pressure), were vetoed by Putin’s Russia and Xi’s China. When Obama tried to gather support for his limited military intervention against Assad’s chemical stock piles (2013), without Security Council approval, it was only France that was willing to go along. The UK-government did not get any go-ahead from its parliament, there was no support from the Arab League and there was no NATO-support. Any humanitarian military intervention would have met the same wall of silence. So those who blame the lack of military threat as the main cause for giving “the regime and its allies full immunity to kill the rebellious Syrians with other weapons.” (quote of Yassine Al-Haj Saleh from his October 06,2017 interview to alaraby.co.uk), should stop citing Obama’s red line as the principal cause. As an act of self-defense, it had absolutely nothing to do with it. The only way to put meaningful military pressure would have been the threat of a humanitarian military intervention or a military intervention within the Responsibility to Protect doctrine. These actions though bare little to no international support. But by focusing on only military means, Obama’s Red Line criticizers draw away the attention from the circumstance that even the non-military means to put pressure on the warring parties were by far not exhausted. And those should always have priority. Military force should always be a last means of resort. And here I am coming back to what I said at the beginning : wrong analyzes lead to fighting wrong foes. Because where there might be some ambiguity about military intervention, there is no ambiguity about the use of peaceful means of pressure. And there where Obama will never be sued for any wrongdoing with his red line, because there was none, he and his European counterparts bear very well criminal liability for their deeds of omission, and might be obliged to pay reparations to the victims of these omissions. International Humanitarian Law imposes that countries react to breaches of the treaties and take timely and commensurate measures to make them stop. Not taking those measures is a crime of omission, which is a very serious accusation. In international humanitarian law omission is equivalent to action and if omission can be attributed to a state, it will have to pay reparations to the victims. It was already in early 2014 that the international diplomat Lakhdar Brahimi, then United Nations special envoy to Syria, accused the international community of crime of omission in relation to the Syrian war. As a diplomat he could not call out names. We can. In what sense Obama and his European counterparts committed crimes of omission ? It started with their refusal to apply the laws of state responsibility to the Syrian war. Those laws stipulate that countries who finance and arm regimes that commit war crimes and crimes against humanity, share responsibility for those crimes. This means that any action aiming at stopping those crimes has also to encompass those countries. Within the Syrian war context, we have to point at the devastating role that Putin’s Russia and Chamenei’s Iran play. They finance, arm and fight alongside a regime that is responsible for 90 % of the one to two million deaths the Syrian war has caused. A regime that committed war crimes from the very beginning of the conflict, and which already by December 2013 the UN accused of having a character of crimes against humanity. Without their support, the Assadian regime would have collapsed economically by 2012/2013 or there would have been a political solution to the conflict. Under normal application of the laws of state responsibility, Putin’s Russia and Chamenei’s Iran should have been subjected to the same crippling economic sanctions like the ones that were imposed on the Assadian regime. But none of this happened. Europe and the US obstinately refused to take any measures against those two war crimes committing countries. In an TV interview October 2016, on the eve of the assault on East-Aleppo, and after a year of under Russian leadership committed unbearable crimes which observers called a “spit in the face of the international community”, the German minister for foreign affairs Frank-Walter Steinmeier had the guts to declare that sanctions against Putin’s Russia would not save Aleppo. Well, if the laws of state responsibility would have been applied, and timely and commensurate measures taken, the question about saving East-Aleppo would have never been posed. Notwithstanding such brazen attempts to fool public opinion, year after year, with every publication of another devastating report about the multiple crimes committed by the Putin-Chamenei-Assad-coalition, and followed by another deathly silence from European and American leaders, the case for a crime of omission committed by those same leaders, and as such their states, has only been growing stronger. Time will tell if one day the victims will start suing them and will finally get reparations for their sufferings. So far the criminal responsibility of American and European leaders. Honesty and completeness in the discussion of the real foes of the Syrian war, though without claiming to really have explained everything or named everybody, obliges us to cite some more names and clarify one more circumstance. First we have to mention Xi’s China. Together with Putin’s Russia it systematically vetoed all UN Security Council Resolutions that attempted to find a political solution, to investigate war crimes or to force respect for international humanitarian law. None of those resolutions foresaw a military intervention. This was an abuse of the veto-right and was the main cause for the deterioration of the Syrian war into a genocidal massacre. Secondly we have to mention Saudi-Arabia, Turkey and Qatar. They kept on financing and arming rebel groups that did nor respect international humanitarian law. Knowing that international humanitarian law is simply a translation into treaties of the basic principles of Islam, it is remarkable that governments that pretend to protect Islam, violate the principles of Islam in such a gross way. The same counts of course for the Iranian government. Thirdly we have to clarify the assertion of Putin’s Russia and Chamenei’s Iran that their aid to the Assadian regime was legal. It was not. In international humanitarian law, and thus according to the principles of Islam, it is not allowed to arm, finance or fight alongside a warring party that systematically commits war crimes and crimes against humanity. 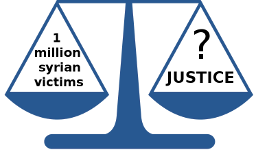 ‹ PreviousOne Million Deaths in Syria ? Really ? Really !